Traditionally styled white on white bridal jewelry will always be desired. This classic estate engagement ring features a bright, clear old European diamond mounted in a platinum square shaped frame. 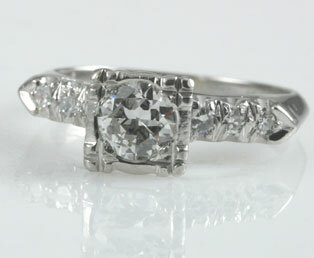 This radiant center diamond (0.55, color H, clarity: VS1) is mounted higher than the adjoining six single cut diamonds. Crafted in platinum, the true white metal.